D.L. HANNON INC. is pleased to introduce our company. 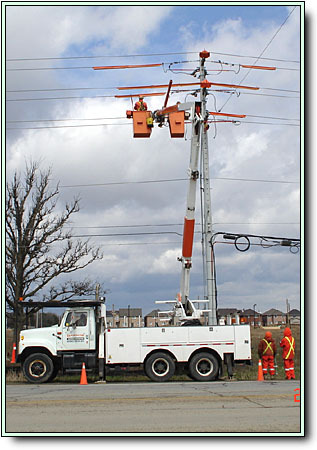 We offer complete overhead line and power distribution services, underground cabling, high voltage splicing and termination, as well as substation construction. Our SERVICE QUALITY philosophy is communication and employee/customer satisfaction. A CRITICAL PATH METHOD (CPM) technique enhances our project planning, scheduling and control to help ensure on-time completion of projects at the budgeted cost. We maintain a HEALTH and SAFETY program with continuing emphasis on injury prevention and awareness. Because of frequent and extensive training, our injury incidents are negligible. We enjoy a favourable merit-adjusted premium rate with Ontario's workplace safety and insurance board (WSIB). D.L. HANNON INC. is an owner-operated company. We would welcome the opportunity to quote on your large or small design/build requirements. We are members of E&U.S.A. and supply all bonding and insurance requirements.